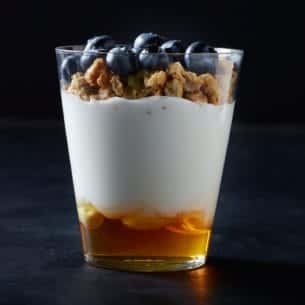 Creamy non-fat Dannon® Greek yogurt is layered with fresh, seasonal blueberries, pure honey and crunchy honey oat granola. Refreshingly delicious. plain nonfat greek yogurt (cultured grade a nonfat milk [contains active yogurt cultures]), blueberries, granola (whole rolled oats, milled cane sugar, rice flour, oat flour, expeller pressed canola oil, molasses, honey, natural flavor, salt, barley malt syrup), honey. produced in a facility that processes tree nuts, wheat and soy.